A few weeks ago, I was recommended this short memoir by a customer in the bar I work in. 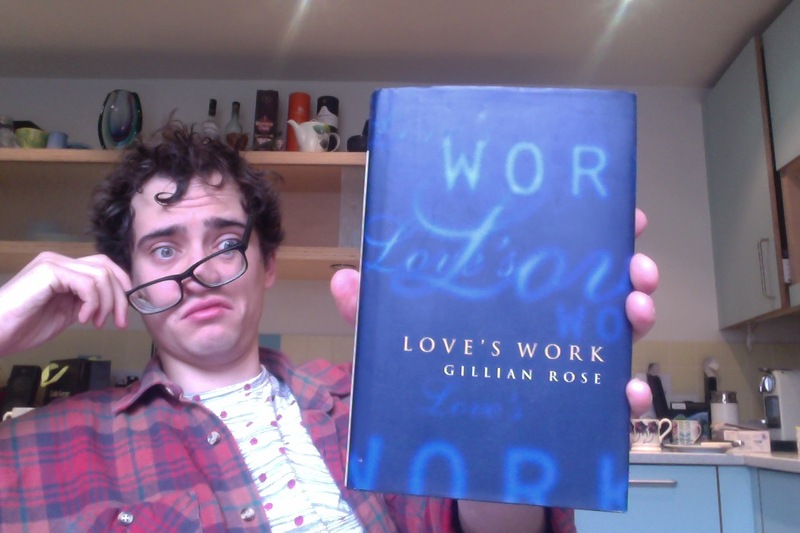 Obnoxiously, like the worst kind of bartender stereotype, I was discussing the novel I’m working on (I was asked, I promise, I don’t just launch into that kind of thing), talking about its themes of spirituality and physicality, and was told to read Love’s Work by Gillian Rose. Because it deals with the same topics. And that, I suppose, is true. This is another one of those memoirs written by an academic just before he or she died, much like Lorna Sage’s disappointing Bad Blood. This one, however, is about a whole life, rather than a small part of it, and it is short and terse and, much like the body Rose was writing about, has a massive chunk of cancer right in the middle that taints (moderately) the optimism and joy that exists either side. Rose wrote this as she was dying, of cancer that had spread from her ovary to her stomach and her bowel. There is a comic scene where she writes about the reality of living with a colostomy bag, but this gross humour comes in the centre of the book, after she has introduced herself as an intelligent, spiritual, sexual and happy individual then suddenly informed the reader that she is dying. Each chapter deals with a different aspect and a different time of her life. There is a discussion of her visiting friends in New York who are dying of AIDS, one a young man who relies on the care of a woman in her mid-90s to get through every day. There is a chapter about an affair with a Catholic priest. There is a chapter about living in an Orthodox Jewish neighbourhood, about studying Hebrew, about visiting Auschwitz. There is a lot of discussion of religion (Judaism and Christianity), about love (familial, plutonic, sexual and romantic), about joy of life, about knowledge and about the exploration of the world. Intellectually and literally. Which is perhaps what we should all try to be. Short, terse, involving and deep. I liked it. Thank you, stranger! Thank you for letting me know about this book.